1972 and updated in 1999 & 2000 by Fredrea Gregath Cook and Carrie Ann Cook, this 8½x11" oversized book format, contains 238 pages of family information. The softcover edition has a long wearing adhesive perfect binding featuring a full color cover. Indexed and including maps, poetry, documents, family information, charts and interesting narrative, photos (not present in the original softbound edition) as well as some Lockhart records from the American Revolution, War of 1812 and the Civil War (Civil War). 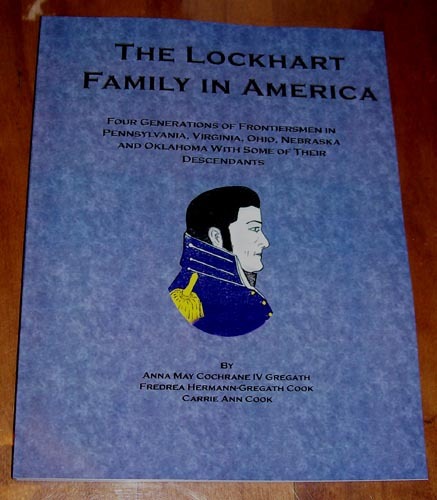 A branch of the Lockharts covering more than seven generations from 1744 Lanark, Scotland to America. Includes four generations of frontiersmen in Pennsylvania, Virginia (Lockhart Plantation in Shenandoah Valley), Ohio, Nebraska, and Oklahoma, with some of their descendants and allied lines. From Robert Lockhart in the American Revolution and on to Brigadier General Josiah Lockhart in the War of 1812, these descendants have faithfully served this country, through time. Relive the run for the Cherokee Strip and claim jumpers, as well as life in the Strip prior to statehood, through the eyes of Joseph Josiah and Dora Belle Alexander Lockhart. Allied family information on the Alexander and Oates, as well as others. Friends of the family and family members have been most gracious and receptive in offering their assistance to make A Lockhart Family in America a reality. To all of you, my sincerest thanks. Each generation of Lockharts sought opportunities to improve upon the past. Their desire for a better life, their trust in God and their faith in America allowed them to overcome and conquer all obstacles that beset them. The four generations of frontiersman faced the unknown, endured countless hardships and even death to help settle and create a free America. Studying the lives and times of our forefathers continues to be a rewarding experience. Their faith in God has given new meaning ad depth to my own religious beliefs. Their love and devotion to one another has brought me greater appreciation for family and friends. Their willingness to sacrifice to achieve their goals in the face of seemingly insurmountable odds, has taught me the true meaning of perseverance. Their allegiance and loyalty to America have added new dimensions to my own patriotism and given me a greater understanding of the cost of the freedoms we now enjoy. The gathering and writing of these records has given me the opportunity to better know and understand our forefathers and to appreciate the past that made a present possible. It has been our pleasure to assist with both the updated and revised editions of A Lockhart Family in America. Doing so, has been yet another thing that has brought these three generations of Lockhart descendants closer together. This book has also served as a means of bringing many family members together and our ancestors to the forefront of our minds. We have really enjoyed this endeavor. Select title and click add to cart.